As is probably very obvious from my most recent birthday party, I’m a bit of a fan of Jurassic Park. It’s because I’m a repressed 15 year old, although check this out and tell me that you don’t love it (**It’s one of my favourite scenes**). If I was as rich as John Hammond, I’d be tempted to try to bring back dinosaurs too (obviously not learning a thing about the effects of tampering with nature…). Luckily for the entire World, I’m not as rich so I’m not currently trying. A graduate from Central St Martins, Anneka managed to mix a sense of fun together with precious metals to create a playful and unique capsule collection. 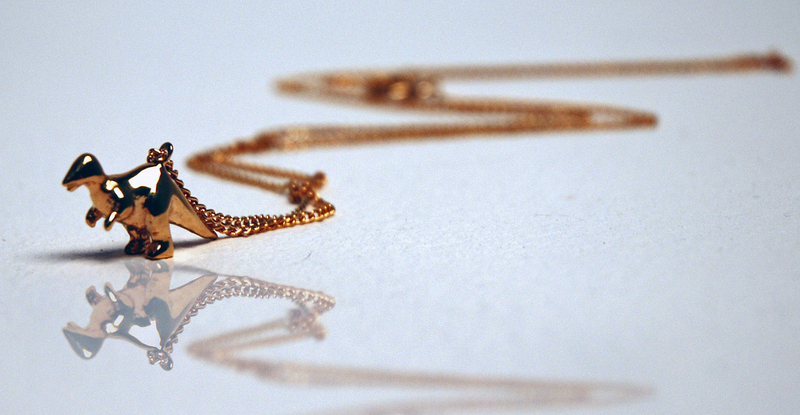 Her adorable dinosaur pendant is made from solid sterling silver plated in 9ct gold. 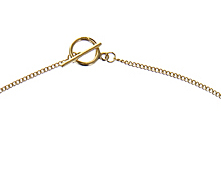 The 26 inch chain features a beautifully delicate toggle clasp, making the whole package look all the more unique. Spanner & Wingnut products are currently stocked at a selected number of boutiques, including Of Cabbages & Kings in Stoke Newington (which is, dangerously, only a lazy 10 minute walk from Three Small Apples HQ…). I might have to pay a little visit this weekend. But maybe I’ll brush up on my knowledge of the UNIX system first, just in case.